It all started on Friday afternoon, feeling stressed with work and needing an escape I found myself surfing the net for flights. A friend of mine had been chatting about a fantastic outfitters based in Mallorca, so with a quick phone call, it was all booked . I flew out that evening with Easyjet (£70.00 return) and was met at Palma airport by an English guy called Pete who ran Tramuntana Pursuits on the Island of Mallorca. By 8.30am Saturday morning I was on the beach in Pollensa admiring the kit and boat I’d hired from Pete. I’m used to having to paddle boats which resemble plastic bath tubs abroad, so imagine my delight when I was given a brand new Dagger sea kayak and even a proper adjustable paddle. Pollensa beach is large and covered in deckchairs and sun canopies. I imagine by the afternoon this now deserted beach is chockablock with people. However the resort has lots of good quality,quite up market hotels and guesthouses so was a perfect place to start my journey. We set off at 9am and headed towards the little lighthouse on Cap del Pinar. There are a few beaches along the way but most are cordoned off as there owned by the military so you’re pretty much committed for at least an hours paddle. As we rounded the headland Pete warned me about the confused water ahead of us. Confused water!! I think that was a nice way of saying ‘very choppy, adrenalin racing,hard to paddle water. It didn’t last long though and we’d soon been paddling 2 ½ hours and approaching Cala Coll Baix our first stop. Imagine the scene from Jurrasic park as they approach the island, well this is what Cala Coll Baix looks like. A totally deserted beach with steep sides, making it difficult to reach by land. I couldn’t resist diving into the turquoise water and having a swim. After a lunch of brie and grape sandwiches which Pete had brought along, we set off on a 16.4km open water paddle, straight across to the 1000ft cliffs of Cap Ferruch. It was 23 degrees and the paddling conditions were absolute perfection. I did have a slight problem with my trim but I moved a few bottles of my red wine about and it was all fine again. It was almost 6pm when we reached Calla Torta. A popular beach which had a small cabin selling beer and snacks. This was pure bliss after 37km of paddling. As we sat with our beers a lovely lady called Maria came over. It was only then that I realised that most of the people on the beach were completely naked. How I hadn’t noticed everyone was starkus is beyond me, but they didn’t seem to care that I wasn’t so it was fine. Maria used to be a K1 boater and had been watching us paddle towards the beach. She looked really keen to get back in a boat again so Pete kindly offered her his kayak. The funny bit was he insisted she wore a buoyancy aide. There she was in her birthday suit having difficulty doing the zip up on his buoyancy aid and Pete in a conundrum of not knowing whether to offer to help or not. That would have made a great photo to show his wife. Anyway, off they went for a short paddle and I organised the camping gear for the night. At around 7pm the beach became deserted. Maria had gone and it was just me and Pete. Out to sea I noticed a small island and we decided to have a gentle evening paddle towards it. It took about half an hour to get there and we couldn’t land so came straight back. Pete was chef for the night and made a lovely Spanish Risotto which complimented my red wine wonderfully. I had expected a few problems with Mosquitoes and had come prepared but there was a slight breeze and I didn’t hear or see any. 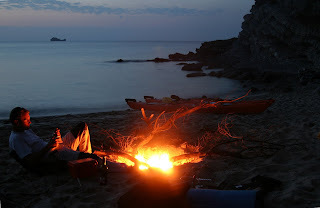 We made a big camp fire in the sand and by 9pm the sun had started to go down and we were treated to a fantastic fiery sunset. We spent that night drinking wine and by 2am we decided we had to go for a swim. It was breathtaking in more ways than one. The water was a little chilly but I soon got used to it. The phosflorecent in the water was like nothing I have ever seen before. When I moved my hands, magical green sparks flew from my fingers tips. I swam on my back and watched the trail of green light follow me. The following morning we were up early and on our way by 6.30am. There was a beautiful sunrise as we headed for the headlands of Cabo del Freu and Cabo de pere with its 200 foot cliffs. The third headland of Punta de Amer took 4 hours to reach. The temperature was 27 degrees and Pete was telling me that during August it can reach the high 30’s. I’d be spending all my time capsizing to cool down if I was out in that. Apparently May,June, September and October are the best for the weather. Although even in December the weather would be sublime compared to the cold wet weather we’d be having in the UK. Our next stop was Cala Petitia. A beautiful small bay with rugged cliffs and the town of Porta Crista only half hour walk away. It would be a fantastic place to camp but it was only half way along our planned days paddling so we didn’t stay long. There was a good easterly breeze that kicked in just after lunch which we definitely made the most of. Along this final stretch there are loads of beaches and bays. Cala Anguila has a beach bar and Cala Magarik has mega climbing if you fancied a break from paddling for a few hours. 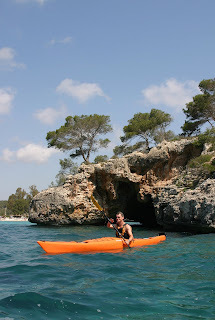 We chose to carry on paddling and soon came across some amazing caves which we just had to explore. From there we paddled to Cala Mandrago, a total of 50km in one day. I was exhausted. Waiting for us on the beach was Pete’s wife and two very cold and inviting pints of lager. She’d come to do the shuttle and to give me a lift back to the airport to catch the 23:55 flight back to Manchester. The whole trip seems like a dream already but best of all, I spent less than if I’d stayed at home. Now all I have to do is decide what to do next weekend. Handy notes: Mallorca doesn’t have a coastguard, so if you get into trouble you’re reliant on local fishermen and sailors for help. It is also difficult to get decent weather reports so be prepared for anything.